Help @FIRSTweets Win The Shorty Awards! 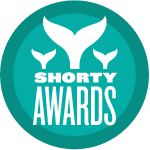 FIRST is running for the Shorty Awards and we're in the lead! If you have a Twitter account, be sure to nominate FIRST for what we do to inspire young people's interest and participation in science and technology.